Problems With Soil Compaction In Your Lawn? Lawn Aeration Is The Perfect Solution! 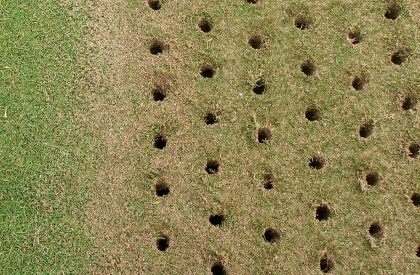 Lawn Aeration can be one of the most beneficial processes for a healthy lawn. This is completed towards the end of the year using a professional heavy machine that pushes tine bars into the soil allowing air and nutrients into the soil profile. 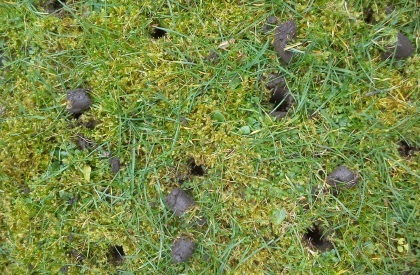 There are two types of Lawn Aeration; Solid core and Hollow core. We will be happy to test your lawn and advise the most appropriate option needed. Why not take advantage of our FREE lawn review service? One of our fully trained, lawn care professionals will be happy to arrange a free lawn review with you. As part of the review they will identify any issues your lawn may have and provide you with a fully costed solution for you to consider. Click here to request a FREE quote. Our service starts with a free, no-obligation survey and quotation. We will then agree a programme of treatment with you on a Pay-As-You-Go basis, no long term contracts are required. Our qualified, professional, licensed, police-checked operators will then take over, delivering a professional treatment programme that targets different aspects of turf development throughout the year. Unfortunately no matter how much love and care we give to our lawn without moisture we have nothing. Without it lawns will not thrive, soon turn brown and go into a dormant state until water is available – put simply, it is the plants defence mechanism to help it survive through dry periods. A recently mowed lawn with a striped finish always looks impressive. The striping is achieved by the rear roller, which gently pushes the grass blades in one direction. Getting the perfect effect can take a little practise depending upon the shape of the lawn being mowed. Rectangular shaped lawns tend to be easier to stripe, irregularly shaped lawns can take a little more practice to achieve the desired result. Fantastic results, great service and one less job for me! Please contact us for a no obligation, FREE quotation!